Brand new phone is likely to be released soon by ASUS as stated in an event this year which was held in Barcelona, there ASUS unveil it next-gen ZenFone series smartphones. According to rumoured that ASUS will be releasing ZenFone 5, ZenFone 5 Lite and ZenFone 5 Max the same time though the fact have not been established until the deal day.The announcement of the new brand was spotted on AnTuTu benchmarking website. 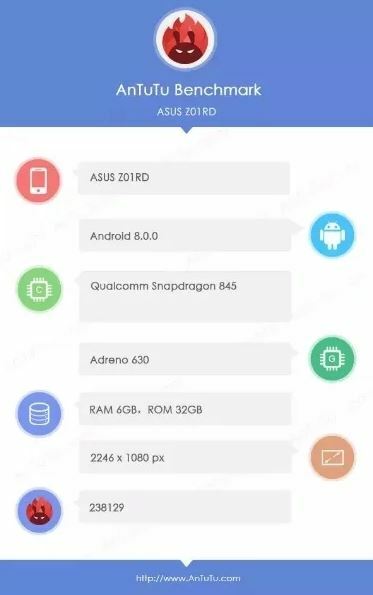 The device was spotted on AnTuTu with the model number ASUS Z01RD. Speculations suggest that this could be the upcoming ASUS ZenFone 5 flagship smartphone. As per the benchmarks, the device will be powered by Qualcomm’s latest flagship Snapdragon 845 processor. The phone will feature a display bearing a resolution of full HD+ and an aspect ratio of 18:9. The benchmarks suggest that the ASUS ZenFone 5 will boot Android 8.0 Oreo out of the box. The phone will get an Adreno 630 GPU for graphics, along with 6GB of RAM. The storage capacity mentioned is 32GB, but we can expect more storage variants of the device to arrive at launch time. Earlier reports indicated that the handset will feature a nearly bezel-free design and will flaunt a pair of primary cameras at the rear. Some earlier reports had suggested that the ZenFone 5 may arrive as the ASUS ZenFone 5Z instead. We will have more details about the handset if and when it goes official at MWC next week, so stay tuned.